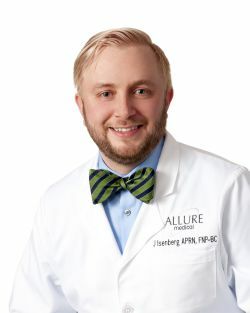 James Isenberg became a Registered Nurse (RN) in 2009, which he earned from Southcentral Kentucky Community and Technical College, with honors. He then attended Frontier Nursing University, graduating in 2015 with his Masters of Science in Nursing, also with honors. Over the course of his career, James also served as a Surgical First Assist and is a member of the Kentucky Coalition of Nurse Practitioners, and the American Nurses Association and the Kentucky Nurses Association. When he's not helping Allure patients look and feel better, James spends his time with his 3 boys and his wife, Danielle. They like to travel, play games and film videos for their YouTube channel, "Raising Gentlemen!"